Museum-lovers will get to explore Seurasaari Island and Open-Air Museum and Kansallisgalleria. Explore hidden gems such as Bellevue Beach and Arboretum Mustila. Venture out of the city with trips to Espoo (Nuuksio National Park & Kaitalampi), Pernio (Teijo national park & Ruukin kehräämö ja puoti Oy) and Porvoo (The Runeberg Home, Porvoo Old Town, & more). Spend the 4th (Tue) exploring nature at Ekenas Archipelago National Park. 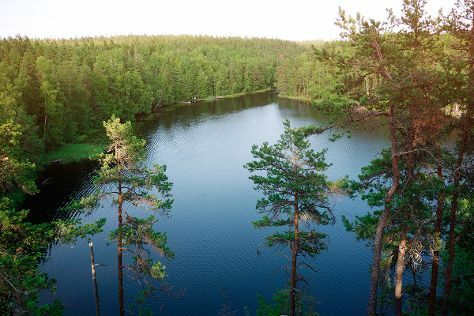 Spend the 13th (Thu) exploring nature at Sipoonkorven Kansallispuisto. There's lots more to do: identify plant and animal life at Niivermaki Nature Conservation Area, make a splash at Ahvenisto Activity Park, wander the streets of Katajanokka, and explore the wealth of natural beauty at Valkmusa National Park. To see more things to do, where to stay, traveler tips, and more tourist information, you can read our Helsinki attractions planner . If you are flying in from Turkey, the closest major airport is Helsinki Vantaa Airport. In November, daytime highs in Helsinki are 5°C, while nighttime lows are 0°C. Finish your sightseeing early on the 29th (Sat) so you can travel back home.